What is the SentryOne Performance Analysis Dashboard? DBAs need a holistic view of their performance data. No other performance monitoring tool on the market comes close to the power and depth of the SentryOne Performance Analysis Dashboard. With the Performance Analysis Dashboard, you can display important database performance metrics used in determining both the load and health of the monitored SQL Server instance. The SentryOne dashboard shows you both your Windows (or virtual host) metrics and the metrics related to the monitored database server. You have two dashboard modes: Sample mode, and History mode. In Sample mode, you can see activity for a specific time, and in History mode, you display how Windows and the SQL Server instance have been performing over a selected time period. In History mode, you can also overlay your display with a baseline that shows your server's current performance data relative to the chosen benchmark baselines. In this view, you might even see warning indicators for various SentryOne Advisory Conditions. Advisory Conditions are an alerting and response system that allows you to truly customize the SentryOne platform to respond to any condition with complex logic based on performance thresholds, query results, and more. Our dashboard is split into different sections, including the Network section, which displays the network traffic and utilization of information related to a monitored server. The CPU usage section shows the total CPU usage of the server as well as details on context switching, user time, kernel time, and more. The System Memory section displays information about the amount of memory that is being used by different processes on the server as well as page faults and page file usage. The Disk I/O section displays the read and writes latencies for each of the physical disks on the server. The SQL Server Activity section displays information about what the server instance is doing—such as blocked processes, average transactions per second, and more. The Wait section presents information about the classes and categories of waits that have occurred as well as the duration in milliseconds that these waits were in effect during that time period. The Database Memory section provides information about how the server instance is utilizing the memory that has been allocated to it—such as buffer cache size, plan cache size, and more. The Database I/O section provides information about the read and write latency of your databases, lazy writes, and more. 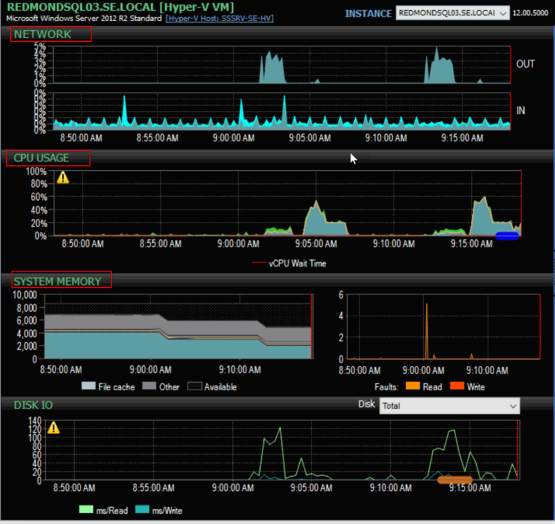 Provides comprehensive dashboarding capabilities to help monitor any size SQL Server installation. Offers two modes, Sample and History, for viewing various performance metrics. Shows SQL Server and Windows (or virtual host) metrics in two distinct viewing panes. Displays performance data, in colored graphs and charts, that are most appropriate for a particular metric. Shows warning indicators to alert on Advisory Conditions set by you. Allows you to navigate between the dashboard and other performance analysis tabs seamlessly. This core platform feature is available across all SentryOne monitoring products. Ready to see SQL Server performance details at a glance?